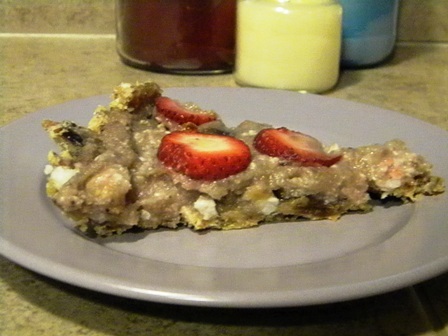 This was my first raw food recipe. It turned out really good! Place dates, almond flour, and coconut into food processor. Process until everything sticks together. Press mixture into glass pie pan. Press evenly across the bottom of the pan and up the sides. Should be about a quarter inch thick (or a little thicker on the bottom). Place pie pan in refrigerator and refrigerate while you prepare the filling. Mash banana (if banana starts to turn brown add a few drops of lemon juice). 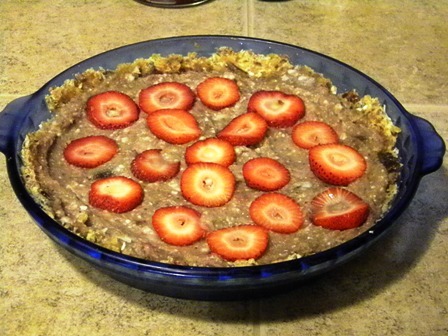 Place dates, mashed banana, coconut butter (if butter is solid warm it up just slightly to soften), coconut flour, and 1/2 cup of the strawberries in food processor. Process until just smooth. Place the rest of the sliced strawberries on top of the filling. Place pie back in the refrigerator and let chill for at least two hours so filling can set. Slice and carefully remove from pan to serve. looks absolutely delicious! i love strawberries this time of year:) thanks for sharing! Thanks! I just checked out your website – I like it a lot!